This client webinar, offered an update on our current thinking and explanation of recent portfolio actions. Specifically, we reviewed reasons for our current conservative portfolio profile, and discussed what would turn us more positive in our stock market outlook. Tom began by highlighting the similarities of the past 16 years’ trading range to the late 1960s to early 1980s trading range, where the markets travelled far and wide but made no real progress. 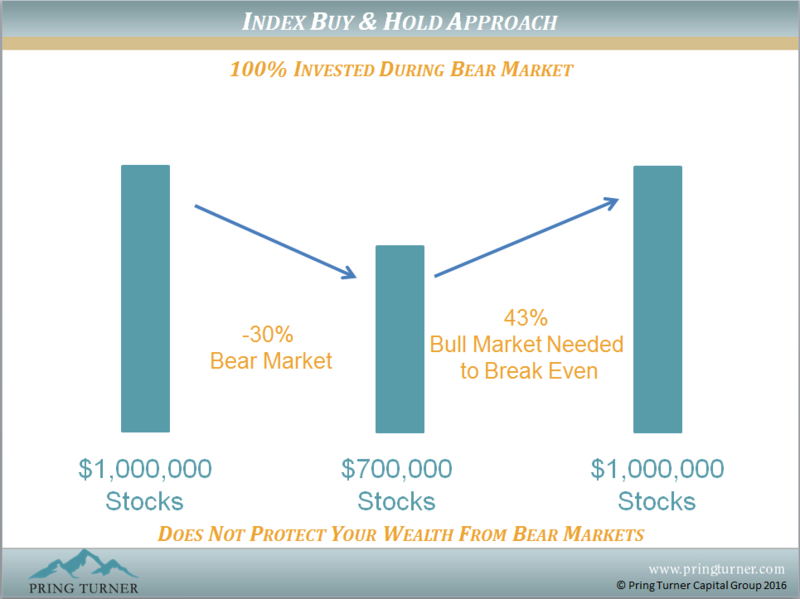 Then he reviewed a chart that demonstrated how Pring Turner’s active investing approach has provided steady growth compared to passive or index investing, especially when applied to retirees who are taking a monthly withdrawal to live on. Jim followed by discussing a core thesis of Pring Turner, which is that we are always on the path for continuing improvement. One recent improvement was to enhance our barometer results with a more comprehensive model based on our multi-decade experience with financial modeling. So, Jim introduced our Stock Speedometer, a primary trend indicator, and explained its powerful results. Next, Joe introduced the concept of stress testing your portfolio for a bear market. Stress testing means you understand how well your portfolio will survive a typical bear market decline. He demonstrated the importance of having a prudent discipline, such as how the Stock Speedometer helps an investor sidestep much of a bear market decline and how an emphasis on high quality stocks will further protect investors. The end result is a much more favorable and tolerable path to compounding wealth. Martin continued the webinar by reviewing two charts that displayed some of the rationale for our current defensiveness, and showed why we may be near the end of the current bear market. One chart demonstrated how value stocks were taking leadership over growth stocks after several years of under-performance. This is good news for Pring Turner clients as we emphasize value stocks in your portfolio. Tom wrapped up the webinar and concluded that our portfolios are currently in a ‘protect’ mode, but we are prepared to put the offense back on the field as the evidence turns positive. Last summer and again to start the New Year, it felt like markets drove off a cliff with deep and sharp market declines. Have we bottomed out? Are we there yet? This update explains why we continue to drive portfolios at a safer speed. As a quick reminder, Pring Turner’s roots go back to 1968–the year both Joe Turner and Martin Pring entered the financial business. The volatile period for stocks and bonds that followed helped frame Pring Turner’s conservative investment strategy. Specifically, a conservative strategy was designed to follow and take advantage of the normal swings in the business cycle. The major objective of the strategy is to protect portfolios during occasional down periods and grow wealth during favorable conditions. The last 16 volatile years have shown similarities to the 1970’s with both cyclical ups and downs. For a buy and hold investor who is also a retiree taking out monthly withdrawals ($50,000 annually), it has been especially difficult. For example since 2000, $1,000,000 invested in the S&P 500 has dwindled to just over $338,000 (red line)–and there is still a need to withdraw $50,000 per year to meet retirement spending needs. On the other hand, the typical Pring Turner client (green line) has taken out the same withdrawals and protected the original nest egg with a current balance of just under $1,100,000. Our active investment strategy, born in the 1970’s and continually honed has outperformed passive or index investing approaches while taking roughly half the market risk. Your valuable nest egg and your income have been protected over the long run by Pring Turner’s conservative investment management. A key core principle of ours is to always be on a path to continual improvement, even with our many decades of experience. In other words, how can we do a better job for you? Our latest improvements to our investment process include the broadening of indicators used in our reliable Stock Barometer. The new and enhanced version of our “primary trend indicator” is nicknamed the Stock Speedometer. Essentially, this model helps us decide if we should be driving portfolios fast (growth mode) or slow (protect mode). 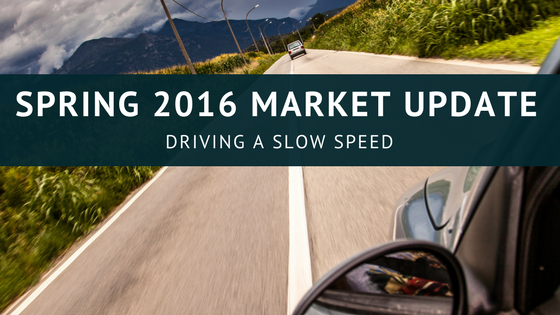 How has the Stock Speedometer performed in the past and what is the reading today? Since last fall this risk management tool has fallen into the “danger” zone where historically returns are negative. As of the beginning of March, the indicator was at zero—it’s lowest possible reading and only the 4th time in 16 years that it has reached the zero level. We will remain defensive in your portfolio until road conditions improve and we deem it safer to “drive” portfolios faster. The good news is that about ¾ of the time the Stock Speedometer is in the “safety” zone and above average returns are possible. Even though cautious today, we are preparing for the next favorable signal from this important long term stock market indicator. The Stock Speedometer clearly defines whether it is time to protect or grow your valuable assets. This chart clearly illustrates why a buy and hold approach is hazardous to investors, especially retirees. Bear market declines are a fact of life and can seriously disrupt a family’s secure retirement. Observations over long periods of time show that the stock market spends nearly 70% of the time in a decline and in its subsequent recovery. This means an index or “passive” investor spends the majority of their investment lifetime losing money and spending time recapturing their stock market losses—a very sobering thought. The illustration above shows how the average 30% bear market means that a passive investor needs to re-grow their portfolio by 43% just to get back to even. Doesn’t it make sense to have a game plan to prevent large losses that require so much time and gains to fully recover your capital? How does Pring Turner manage risk to smooth out the ups and downs? One way Pring Turner minimizes losses and reduces risk in your portfolio is to focus on higher quality stocks. 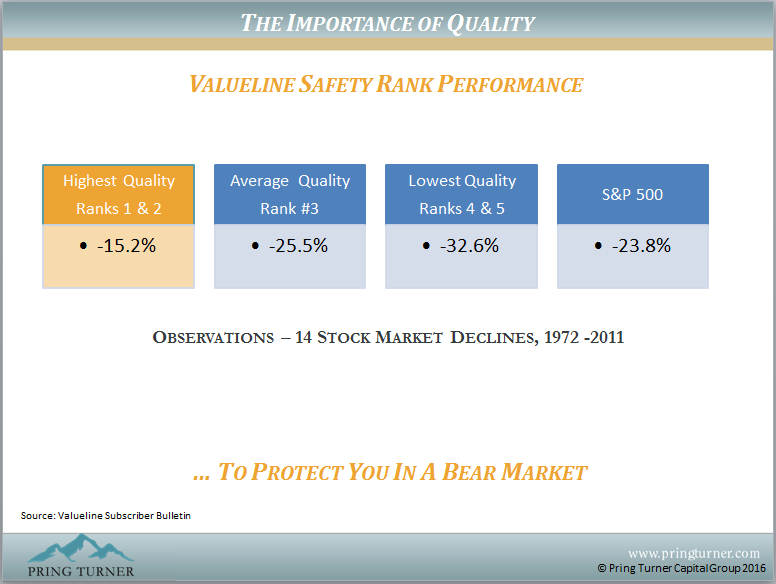 The highest quality stocks using ValueLines’ safety ranking clearly show less downside volatility during stock market declines. Share prices that decline less during bear markets will allow your portfolio to recover quicker and move to new highs during the next favorable period. As your investment advisors we continually “stress test” your portfolio. 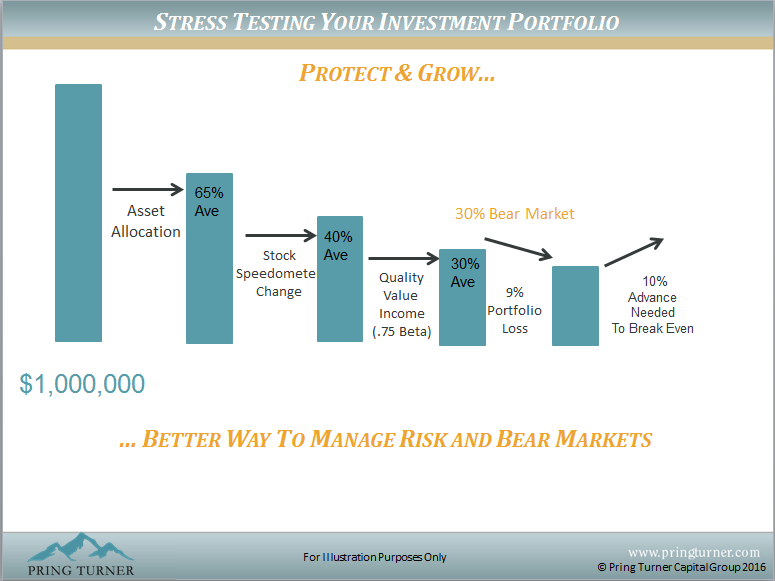 Stress testing means how well your portfolio will survive a typical bear market decline. The combination of active asset allocation shifts to reduce stock exposure during hazardous road conditions—for instance, when our Stock Speedometer is in the “danger zone”, and only holding higher quality stocks further protects portfolios from large declines. The end result is a much more favorable and tolerable path to grow your wealth over the long run. 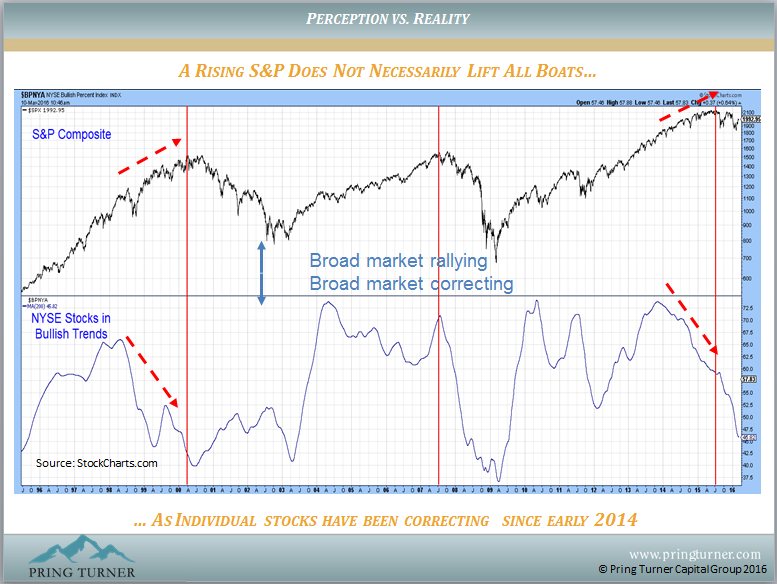 Not infrequently there is a mismatch between stock market perception vs. performance reality. Once again, while the major stock market indexes remain close to their highs, the majority of stocks have been declining since mid-2014.The above illustration compares the S&P 500 with the percentage of stocks on the New York Stock Exchange in “bullish” or favorable price trends. Note the divergences today in behavior between these two indicators, similar to the major market top in 2000. The good news is the prices for many stocks have already declined 20% or more, thus building values and creating a shopping ground for future investment opportunity. We are looking for evidence besides our Stock Speedometer that would help us turn more positive. One such indicator we follow has been signaling weakness for a while now, but is approaching levels that have in the past signaled the start of a new bull market. Financial velocity is simply a combination of momentum for the three main asset classes: stocks, bonds and commodities. While it has been declining steadily over the last year it is getting close to turning up once again. When it does, profits will come more easily. Many studies have demonstrated value has outperformed growth with much less volatility over the long run. Conservative investors are better served with value stocks that pay consistent dividend returns. There are shorter periods of time where glamourous growth stocks outperform value as in the past two years. As illustrated in the chart above, the last few years shows growth outperforming value but we see the tide (and momentum) turning once again in favor of value. This is good news for you due to our emphasis on value investing in quality companies. Your portfolio is in “protect” mode for now, but we are preparing to put the offense back on the field as the evidence turns more positive. Pring Turner Capital Group (“Pring Turner”) claims compliance with the Global Investment Performance Standards (GIPS®) and has prepared and presented this report in compliance with the GIPS standards. Pring Turner has not been independently verified. Pring Turner is registered with the U.S. Securities and Exchange Commission under the Investment Advisers Act of 1940. The firm offers investment management services to individuals, IRAs, family trusts, corporations, corporate retirement plans, foundations and, as sub-adviser, to other investment advisers. A complete list and description of all of the firm’s composites is available upon request. The Composite was created on November 2011 and was previously referred to as the “Conservative Growth Composite” up and until October 2011. It is comprised of fee-paying; fully discretionary accounts managed by the firm without substantial liquidity or investment management constraints. The Composite includes portfolios following our conservative investment style that stresses preservation of capital, income, and growth to attain superior returns with low risk through both good and bad market cycles. The minimum account size for this Composite is $50,000. Valuations are computed and performance is reported in United States dollars ($). Total firm assets represent the aggregate fair market value of all discretionary and non-discretionary assets managed by the firm and include all fee and non-fee paying assets. Individual portfolios are valued in a manner that is consistent with the definition of fair value and the GIPS valuation principles. We do not use subjective unobservable inputs to value portfolio investments. The Conservative Growth & Income Composite does not employ leverage or derivatives. The S&P 500 is our benchmark. The Conservative Growth & Income Composite contains portfolios following our conservative business cycle investment style. Tactical asset allocation decisions, sector rotations, and quality adjustments are made in an attempt to outperform the S&P 500 (on a risk-adjusted basis). Portfolios within the composite are diversified into multiple asset classes (equities, fixed-income, and cash/equivalent investments). The S&P 500 is solely a stock index based on the market capitalization’s of 500 large companies and does not hold any fixed income or cash/equivalent investments. Pring Turner’s goal is to outperform the S&P 500 over an entire business cycle (on an absolute performance and risk-adjusted basis). The S&P 500 Index is calculated on a total return basis with dividends reinvested and is not assessed a management fee. “Standard & Poor’s®” and “S&P 500®” are trademarks of The McGraw-Hill Companies, Inc. The 3-Year Standard Deviation represents the annualized standard deviation of actual composite and benchmark returns, using the rolling 36-months ended each year-end. The Composite’s internal dispersion is measured using an asset-weighted standard deviation of returns in the composite. The investment management fee schedule for the composite is 1.25% on the first $1 Million and 1.00% on amounts over $1 Million. Actual investment advisory fees incurred by clients may vary. Further information regarding Pring Turner’s investment advisory fees is described in Part 2A of the firm’s Form ADV. Clients employ fee-in-lieu-of-commission brokerage accounts or commission-based accounts. The fee paid to the broker-dealer covers the registered representatives’ services, brokerage execution, and custody. Various other fees may also be charged by a broker-dealer and/or custodian (e.g., wire fees). Net performance figures are presented (a) gross of withholding taxes and (b) net of all investment management fees, custodial fees, trading expenses, and other fees. Actual investment management fees paid to the firm are used to calculate investment performance. No account included in the composite has a performance based fee arrangement. The performance figures include income, realized and unrealized gains and losses. Performance figures also include foreign withholding taxes on dividends, interest income, and capital gains. Policies for valuing portfolios, calculating performance and preparing compliant presentations are available upon request. The investment results shown are not necessarily representative of an individually managed account’s rate-of-return.